Ovid (Publius Ovidius Naso; 43 BC-AD 17) the most widely read and imitated of Latin poets and considered 1 of the 3 great canonical poets of Latin literature the with Virgil and Horace. Augustus banished Ovid in AD 8 to Tomis on the Black Sea (Romania today, Thrace then) for reasons that remain mysterious. Ovid died at Tomis after nearly ten years of banishment. From his own time until the end of Antiquity Ovid was among the most widely read and imitated of Latin poets; his greatest work, the Metamorphoses, has been a favorite longer than other book since it precedes the bible. It's influence has been great and is said to have been much revered by Shakespeare himself. But those at whose hands Persephone accepts atonement for her ancient grief, their souls in the ninth year she sends up again to the sun of this world and for all time to come they are called of men holy heroes. Pindar, fragment quoted by Plato. In Orphic theology, Dionysos is the son of Persephone, Queen of the underworld, rather than Semele. Zeus remains his father; he is said to have impregnated his daughter Persephone in the form of a snake. The Orphics both identified the soul as separate from the body, and gave a reason for it being present in the body: it is being punished. The reason for the punishment is alluded to in the passage above. The ancient grief of Persephone, according to one argument, is sorrow for the death of her son Dionysos at the hands of the Titans. Humans pay the punishment because they were formed from the Titans ashes and have a Titanic nature. By living an Orphic life and avoiding the bloodshed which is the legacy of the Titans, humans may pay the penalty and achieve freedom. Lesbos is an island located in the northeastern Aegean Sea. It is the third largest Greek island and the seventh largest in the Mediterranean. It has an area of 630 square miles with 230 miles of coastline. Lesbos is the birthplace of several famous persons. In archaic times, Arion developed the type of poem called dithyramb, the progenitor of tragedy, Terpander invented the seven note musical scale for the lyre, followed by the lyric poet Alcaeus. Best known is poetess Sappho reputedly considered by Plato as the tenth Muse. In ancient times there was a King of Thrace by the name of Oeagrus. Not satisfied with mortal women, he fell in love with the Muse Calliope. She found him to her taste, and of their union was born a boy, whom they named Orpheus. Calliope had the divine gift of song, and she taught her son well. So beautiful was the boy's singing that the god Apollo himself was charmed, and made him a gift of a lyre that played so sweetly it made even the stones weep. Although many names of musicians are recorded in ancient sources, none played a more important role in the development of Greek musical thought than the mathematician and philosopher PYTHAGORAS (6th-5th century BC). According to legend, Pythagoras, by divine guidance and some schooling in the temples of Egypt, discovered the mathematical rationale of musical consonance from the weights of hammers used by smiths. He is thus given credit for discovering that the interval of an octave is rooted in the ratio 2:1, that of the fifth in 3:2, that of the fourth in 4:3, and that of the whole tone in 9:8. Followers of Pythagoras applied these ratios to lengths of a string on an instrument called a canon, or monochord, and thereby were able to determine mathematically the intonation of an entire musical system. The Pythagoreans saw these ratios as governing forces in the cosmos as well as in sounds, and Plato's Timaeus describes the soul of the world as structured according to these same musical ratios. Pythagoras appears as a character in the last book of Ovid's Metamorphoses , where Ovid has him expound upon his philosophical viewpoints. His head and lyre, still singing mournful songs, floated down the swift Hebrus to the shore. There, the winds and waves carried them on to the Lesbian shore, where the inhabitants buried his head and a shrine was built in his honour near Antissa. The lyre was carried to heaven by the Muses, and was placed amongst the stars. The Muses also gathered up the fragments of his body and buried them at Leibethra below Mount Olympus, where the nightingales sang over his grave. His soul returned to the underworld, where he was re-united at last with his beloved Eurydice. "I call upon loud-roaring and reveling Dionysos,primeval, two-natured, thrice-born, Bacchic lord,savage, ineffable, secretive, two-horned and two-shaped. You take raw flesh, you have triennial feasts, wrapt in foliage, decked with grape clusters. 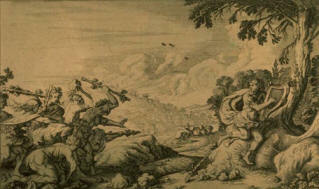 Resourceful Eubouleus, immortal god sired by Zeus When he mated with Persephone in unspeakable union. Hearken to my voice, O blessed one, and with your fair-girdled nurses breathe on me in a spirit of perfect kindness." 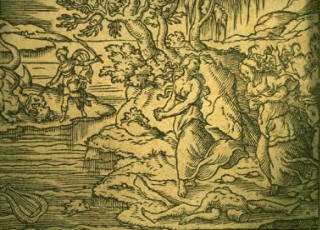 Orpheus about to be killed by Maenads. Metamorphoses Bk XI: 1-43. Ovid recounts that the Thracian Maenads, Dionysus' followers, angry for having been spurned by Orpheus in favor of "tender boys," first threw sticks and stones at him as he played, but his music was so beautiful that it charmed even inanimate objects, and the missiles refused to strike him. 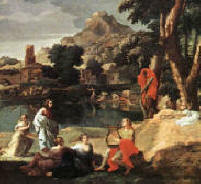 Muses mourn while head of Orpheus floats down the Hebros River. Metamorphoses Bk XI: 44-66 Eventually the head floated ashore onto the island Lesbos,a centre of poetry and the home of Greek's Sapho. "The head of Orpheus, singing always, is found by the Muses, and buried in the sanctuary at Lesbos," writes Harrison in PROLEGOMENA TO A STUDY OF GREEK RELIGION (1908). "Who are the Muses? 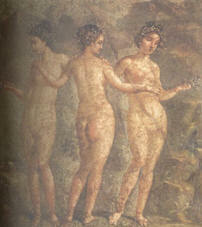 Who but the Maenads repentant, clothed and in their right minds." Harrison also notes that the murderous maenads were punished for their act by being tattooed with the image of a stag, an animal associated with Dionysian sacrifice, on the upper part of their right arms. 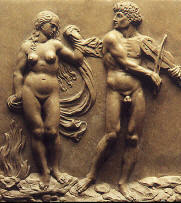 Through the story of Orpheus, Ovid resolves the conflict between Apollo and Dionysus. As one of the pioneers of civilization, Orpheus is said to have taught mankind the arts of medicine, writing and agriculture. 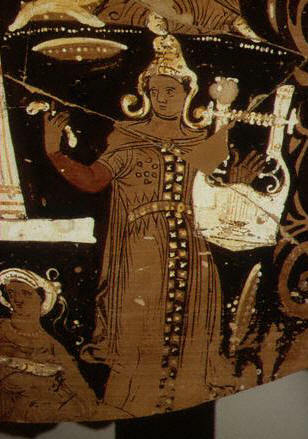 Closely connected with religious life, Orpheus was augur and seer; practiced magical arts, especially astrology; founded or rendered accessible many important cults, such as those of Apollo and Thracian god Dionysus; instituted mystic rites, both public and private; and prescribed initiatory and purificatory rituals. Most scholars believe Dionysus originated in Thrace, which was centered in today's Bulgaria. The Hellenic world, after Alexander’s conquest, spread the cult of Dionysus internationally, to Egyptian Alexandria, where he was associated with Osiris (eventually merging with him as Serapis); to Palestine, where he was associated with the Baals, and even the Adonai of the Jews (who had Dionysus imposed on them by the Hellenes); and most far flung of all, to India, where he became associated with Shiva. These various connections all fed back to the Aegean, where the cult became increasingly complex and cosmopolitan. This would also led to a breakaway mystical form of Dionysianism that would become part of the more philosophical Orphic and Pythagorean Mysteries (where Dionysos was effectively seen as the creative Primal Chaos before creation, beyond all manifest duality, as well as the paradoxical, dynamic balancing force still active within it, the ‘King of the World’, whose final liberation included not only that from orderly civilization but from the natural world itself! ), a move in sharp contrast with the earthy and irrational primitive rite of Dionysos, that in some places still existed alongside it. Later Orphic versions of the Dionysos myth and ritual were more complex, involving the dismemberment of the young Dionysos by Titans and his reintegration and resurrection as a second Dionysos, with the assistance of Athena and Apollo. The myths and rites involved clearly reflecting the Osiris Mysteries, and the unifying cultural syncretism that characterized Orphism.